Maintaining the chemical composition of a wine is essential for the wine industry. Although the sugar-acid balance of a wine is of primary sensory importance, individual acids and oenological variables are equally important. Méthode Cap Classique (MCC) wine is a sparkling wine produced in South Africa using the traditional Champagne method. The chemical composition of most wines are influenced by factors such as production area, grape variety, vintage, terroir, viticultural practices and winemaking techniques (Dobrowolska-Iwanek et al., 2014). Although these factors are critical for wine characterisation and differentiation, their role in MCC wines remains unclear. To date, very few studies evaluated MCC wines during different production stages and none on the impact of grape temperature on oenological and organic acid characteristics. In general, wine quality can also be attributed to the sugar-acid balance, hence acidity adjustment is a prerequisite in many wine cellars, depending on the wine laws governing the country/region. Although total acidity is crucial in wine, all individual organic acids, such as succinic, pyruvic, acetic, citric, lactic, tartaric and malic acids, play critical roles in defining the organoleptic character of the wine. Malic, citric and tartaric acids are the main acids derived from grapes, whereas acids, such as pyruvic, succinic and acetic, are fermentation-derived (Volschenk et al., 2006). The sensory impacts of grape and fermentation-derived acids are well known, since higher concentrations of these acids are associated with too much acidity, while lower concentrations are associated with flat, unacceptable wines (Shiraishi et al., 2010). There is limited knowledge regarding how changes in environmental/fermentation conditions affect organic acid levels of the MCC wines. Based on long-term mean monthly temperatures (http://gis.elsenburg.com/apps/cfm, accessed on 19 June 2017), Robertson is generally classified as a warmer production region than Elgin. Chardonnay and Pinot noir grapes (2015 vintage) were collected from these diverse regions, harvested at 19°B sugar content, transported to Nietvoorbij research cellar and then stored in temperature specific cold rooms at 0, 10, 25 and 30°C until the required grape temperature was achieved. For each region, cultivar and temperature treatments, grapes were pressed (whole bunch) and the free-run juices were subjected to standard MCC production protocols. Final MCC wine samples were filtered through 0.45 µM nylon membranes and analysed for organic acids using an enzyme robot (Arena 20XT, Thermo Electron, Finland). More detailed procedures can be accessed from the South African Journal of Enology and Viticulture (Chidi et al., 2018). The impact of grape temperature at pressing on organic acid profiles of MCC wines for different regions was assessed in the current study and Figure 1 shows the principal component analysis (PCA) illustrating such influences for two different regions (Robertson and Elgin). In both cases, sample grouping of grape temperature treatments for both origins were observed. Lower grape temperature (0 and 10°C) treatments were characterised by high malic and citric acid levels of the Elgin MCC wines. While information on the impact of grape storage temperature on organic acid levels of the wines is still lacking, higher malic and citric acids concentrations of the wines were expected from cooler regions (Elgin). This is because of their direct association with slow acid degradation/respiration rates of grape acids (Volschenk et al., 2006). Additionally, malic and citric acid extractability during pressing seemed to be highly promoted at lower grape storage temperature conditions. 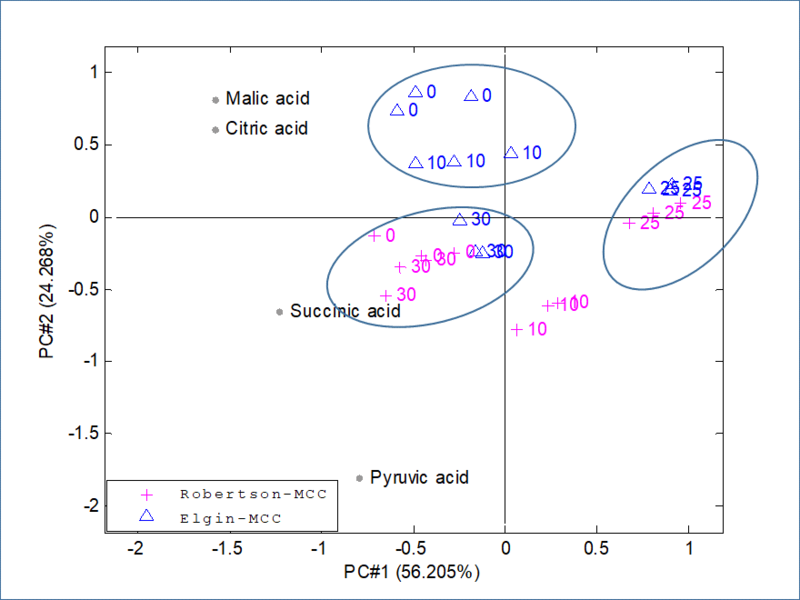 Succinic acid, on the other hand, showed noticeable regional and temperature dependent profiles. In both regions, higher temperature treated grapes (30°C) yielded more succinic acid. However, regional dependent differences were also confirmed when Robertson treatments (0°C) were also characterised by higher succinic acid levels. 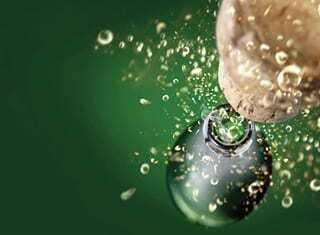 There are many other factors (e g environmental) that impact on organic acid profiles of the wines, but it is still unclear how temperature treatments affected succinic acid (fermentation-derived acid) levels of MCC. It is, however, also plausible that variations in the juice nutritional composition occurred after grape pressing, and this might have eventually affected yeast succinic acid metabolism. FIGURE 1. A PCA bi-plot showing the impact of grape temperature on organic acid profiles of MCC wines for different regions (Robertson and Elgin). Interestingly, some similarities in organic acid trends were identified at 25°C treatments for both regions. This is the temperature where regional variations did not define acid profiles of the MCC wines. The study was unable to identify possible drivers of pyruvic acid profiles in MCC wines. However, higher pyruvic acid levels were noted after the secondary fermentation stage. Indeed, this trend revealed a production stage dependence for organic acids (data not presented here). 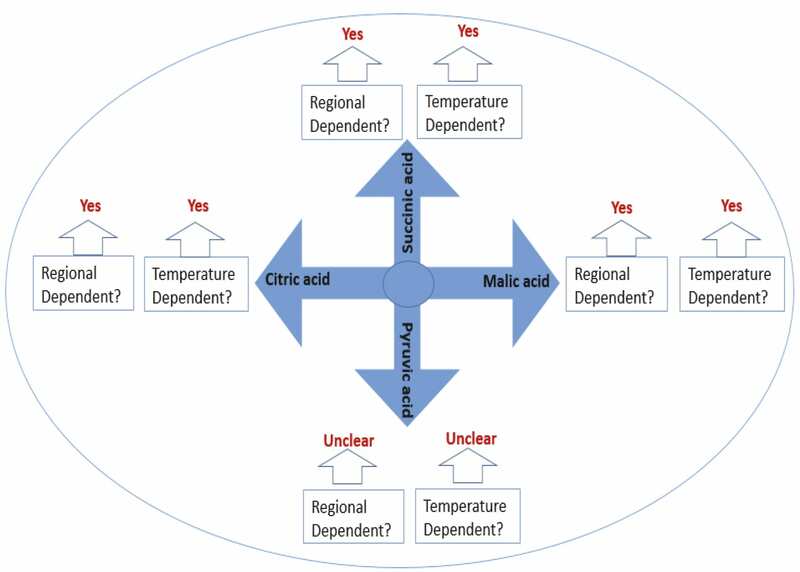 While many other factors may affect organic acid profiles of MCC wines, the current study highlighted some critical factors (based on regional and grape temperature variations) that impacts on individual acid profiles (Figure 2). FIGURE 2. A descriptive outline of organic acid trends as a function of grape temperature treatments for Méthode Cap Classique wines made from grapes from two different climatic regions. 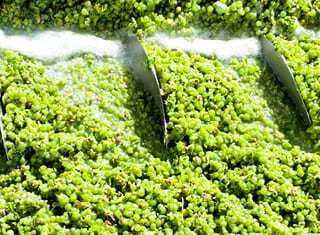 The current study revealed that the grape temperature at press influence organic acids quantitatively and will thus have an impact on final MCC quality. The current study also enabled us to categorise wine organic acids according to regions and provided a better understanding on how the grape temperature control can improve MCC wine quality. 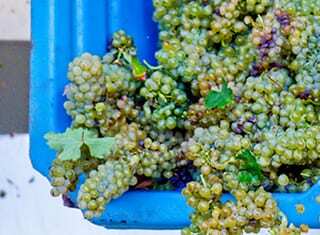 Overall, cold pressed grapes was responsible for higher concentrations of ‘grape-derived’ malic (associated with sour taste of the wine when in excess) and citric acid (associated with freshness of the wines when balanced) of the MCC wines. 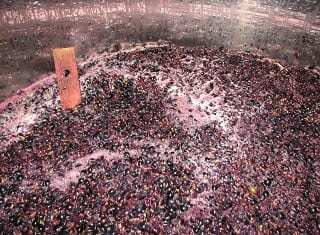 Warm pressed grapes resulted in higher ‘fermentation-derived’ succinic acid (associated with salty bitter taste of the wines when in excess) concentrations of the wines. Pyruvic acid (associated with slightly sour taste when in excess) levels was not affected. Based on these observations, the study recommends the use of cold pressed grapes to maintain higher grape-derived and lower fermentation-derived acid content of the MCC wines. The study provides valuable information that could be incorporated into practical guidelines for winemakers seeking to manage MCC acid profiles. The principal objective of the current study was to investigate the influence of grape temperature on the organic acid concentrations of MCC wines using standard MCC production protocols adopted from the Cap Classique Producers Association (CCPA) and Graham Beck Wines, in an effort to understand how the chemical compositions and the organoleptic characteristics of MCC wines can be managed. • Stellenbosch University and Agricultural Research Council for research facilities. • Charles Fox Wine Estate and Graham Beck Wines for grapes. • Simonsig Wine Estate for the riddling, disgorging and re-capping of wines. • Winetech and National Research Foundation of South Africa (THRIP programme, grant number TP13080525717) for funding. 1. Chidi, B.S., Mafata, M., Notshokovu, Z. & Van Jaarsveld, F., 2018. Impact of grape temperature at pressing on organic acids and oenological characteristics of Méthode Cap Classique wines. South African Journal of Enology and Viticulture 39(1), 106 – 115. 2. Dobrowolska-Iwanek, J., Gąstol, M., Wanat, A., Krośniak, M., Jancik, M. & Zagrodzki, P., 2014. Wine of cool-climate areas in South Poland. South African Journal of Enology and Viticulture 35(1), 1 – 9. 3. Shiraishi, M., Fujishima, H. & Chijiwa, H., 2010. Evaluation of table grape genetic resources for sugar, organic acid, and amino acid composition of berries. Euphytica 174, 1 – 13. 4. Volschenk, H., Van Vuuren, H.J.J. & Viljoen-Bloom, M., 2006. Malic acid in wine: Origin, function and metabolism during vinification. South African Journal of Enology and Viticulture 27, 2 – 17. – For more information, contact Boredi Silas Chidi at chidib@arc.agric.za.